Lake Tahoe Reno Tours - Limousines - Executive Black Car Service. Let us host an unforgettable day above the pristine waters of Lake Tahoe, or among the casinos of Reno, Nevada, where everyone is lucky! Hire a limousine to make the trip up to Tahoe or Reno in style, without the stresses of driving and traffic. Once there, you can step out of your Bay Area to Tahoe Tours to see the famous crystal-clear waters of Lake Tahoe, spend an afternoon at a world-famous ski resort, or try your luck at one of Reno's big-time casinos. Whatever you want to see and do in the Lake Tahoe and Reno area, travel by limousine and guarantee that your experience will be fun, relaxing, and luxurious. Whether you prefer gazing at mountain views, skiing or snowboarding, hiking, boating, relaxing over lunch on the deck of a lakeside restaurant, or blackjack, poker, craps, and slot machines, San Francisco Limo will help you plan a Bay Area to Tahoe Tour to remember. Your Bay Area to Reno limousine can start out from the San Francisco Bay Area, heading toward the spectacular Sierra Nevada range. See historic Donner Lake and Truckee on the way before you continue on to Squaw Valley, site of the 1961 Winter Olympics. Or visit Lake Tahoe's Emerald Bay with its beautiful waterfall, postcard views, and even Vikingsholm -- a replica of a Scandinavian castle. San Francisco Limo can take you to see Incline Village on the North Shore, Tahoe's most exclusive resort, or travel on to Reno and the main casino strip. 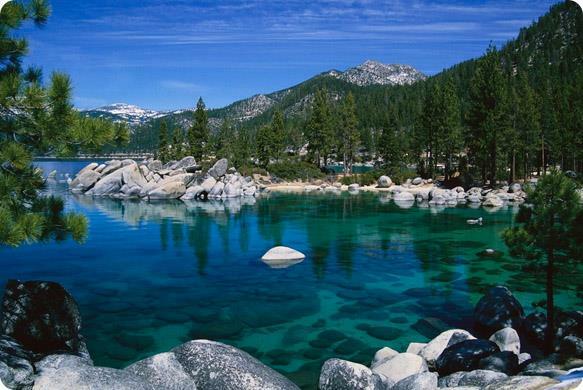 Your Bay Area to Reno trip to Lake Tahoe and Reno will be one to remember!